Stampers and stamp pads are great ways to create easy crafts for kids. 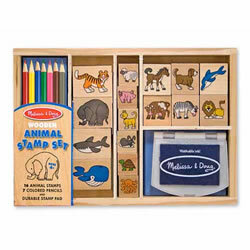 Our stamp art supplies include jumbo stamp pads, paint rollers, wheelie painters, and a variety of stamp sets that feature shapes, colors, numbers, alphabet letters, animals, and transportation stamps. Stamp imprints of anything from nutshells to handprints. Jumbo ink pads have brilliant washable ink. Set of 5. 3 years & up. Jumbo stamp pads have brilliant washable inks. Colors include: red, yellow, green, blue, sky blue, purple, pink, orange, and white -- all the colors a child needs to have a stamping good time! 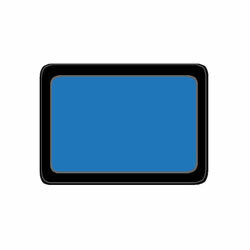 Stamp pads measure 7 1/4" x 7 1/4". Available individually or in a set of 9. 3 years & up. 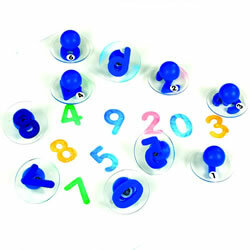 Make learning about numbers and counting fun with this set of 10 stamps, numbers 0-9. Features include comfort grip handle and see-thru top and plastic storage case. Each stamp measures 3" in diameter. 3 years & up. 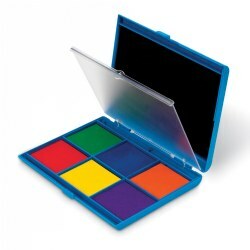 Each color is divided in this 6 color stamp pad so there is no blending of colors. The set includes non-toxic washable ink. 3 years & up. 3" rubber stamps with comfort grip handles and see-thru top for ease in placement. Includes 10 emotions: happy, sad, sick, surprised, content, tired, confused, mad, nervous, and scared. 3 years & up. 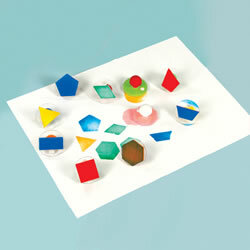 Introduce shapes with this set of 10 geometric shapes stamps. The 3" diameter stamps include a hexagon, circle, rectangle, square, triangle, rhombus, octagon, trapezoid, pentagon and quadrilateral all contained in a reusable, clear plastic case for easy storage. 3 years & up. 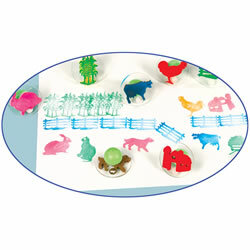 Create life on the farm with this set of ten 3" diameter stamps. Features easy grip handles, see-thru top and comes with reusable storage container. 3 years & up. Encourage literacy with these giant alphabet stamps. The 3" diameter letter features an easy grip handle with see-thru top for easy placement. Use with a stamp pad or paint. Set includes 26 letters and 2 punctuation marks. 3 years & up. Set of 10 large 3" diameter stamps with a family theme. Children can explore their family dynamics as well as the community they live in. Perfect addition to storybook paper. 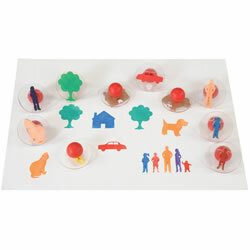 Includes a father, mother, brother, sister, baby, house, cat, dog, car and tree. 3 years & up. Build a farm or use to make flash cards. 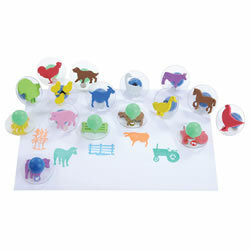 You will find many uses to for this farm themed set of jumbo stampers. The set of 20-3" diameter stamps includes children's favorite farm animals like a pigs, horses, goats, cow,s chickens and more. The barn, fence, tractor and other farm accessories add interest to the farm experience. 3 years & up. 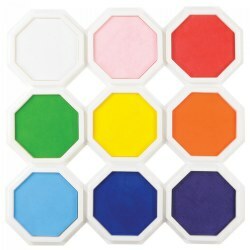 These durable design stampers in geometric and fun shapes work well with stamp pads, paint, dough or clay. 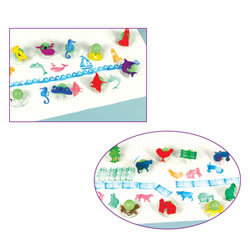 Use the knotched pattern makers to make interesting designs in finger paint and other art mediums. The rubber handle, with its easy-grip design, conforms to a child's hand, making it easy to use. Cleans up with soap and water. Set of 12. 3 years & up. 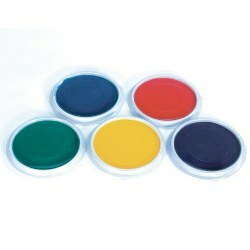 Set of 4 jumbo stamp pads in 4 different skin tone colors. Great for art projects using ink stampers. These 48 chunky stampers are easy to hold, made of dense foam and have 6 different themes. 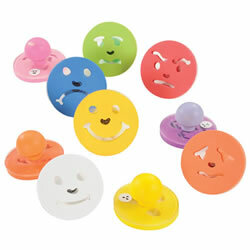 Use these stampers to stamp out clearly defined pictures using paint or stamp pad. Sizes range from 2" to 6". 3 years & up. Take adventures and stamp out stories as you travel by air, land and sea. 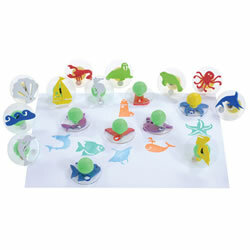 Set of 20-3" jumbo stampers perfect for little hands. Includes tow truck, tug boat, airplane, pickup truck, bus, fire engine, car, bicycle, earth mover, cement truck, train, bulldozer, helicopter, motorcycle, jeep, sailboat, hot air balloon, tractor-trailer, dump truck and wagon. 3 years & up. 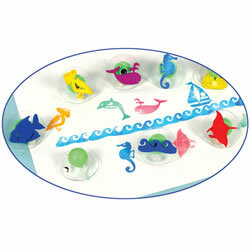 Create a scene from the ocean with this set of ten 3" diameter stamps. Features easy grip handles, see-thru top and comes with reusable storage container. 3 years & up. Explore what lies beneath the sea or go on a voyage to far away lands. Let your imagination take you there as you stamp and create pictures with this set of 20 stamps that includes sea life, boats and accessories.Set includes twenty 3" diameter stamps with easy grip handles and see-through top, as well as a reusable storage container. Encourage literacy with these giant alphabet stamps. 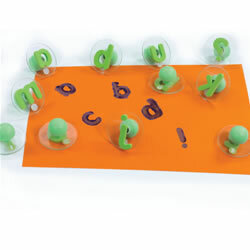 The 3" diameter letter features an easy grip handle with see-thru top for easy placement. Use with a stamp pad or paint. 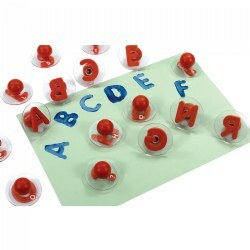 Set includes 26 letters and 2 punctuation marks. 4 years & up. 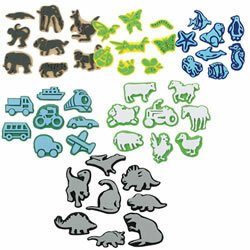 Animal lovers, here's the stamp set for you! Mix and match the detailed stamps with images of wild and domestic animals from land and sea, to create hundreds of beautiful scenes. All the pieces, including 16 stamps, 7 colored pencils and a durable inkpad, store in the sturdy wooden box. Washable, non-toxic kid-friendly ink. Dimensions: 1.5" x 7" x 11" Packaged. Conforms to ASTM D-4236. 3 years & up. Create life on the farm or a scene from the ocean with this set of twenty 3" diameter stamps. Features easy grip handles, see-thru top and comes with reusable storage container. 3 years & up. A new twist on design painting! Spread paint across the gel-like surface; swirl colors together with brush, paint scrapers, or fingers to produce a pattern; press paper on top; and lift up to reveal your pattern design. Cleans up with water. Includes a 9" x 12" paint pad in tray and activity guide. Paper sold separately. Just For Kids washable ink pads are specially formulated with nontoxic ingredients approved by the FDA for use by children. 3" x 2". Made in the USA. 3 years & up. This over-sized pad has all the colors you need to have a stamping good time. The case features 6 rich color ink pads on one side and a large black ink pad on the other. 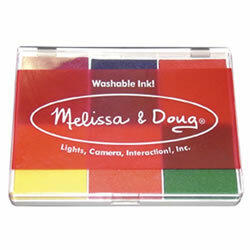 Included: Jumbo 7 Color Ink Stamp Pad with a clear divider: Red, Green, Blue, Orange, Purple, Yellow, and Black. 18 months & up. 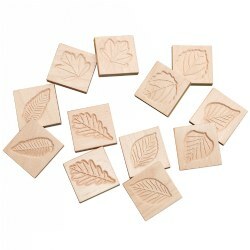 Explore shapes and patterns in nature with this set of 12 wooden leaf tiles. Bring the outside in by using the tiles to make leaf rubbings, printings and molds of each leaf species. Includes 2 tiles of 6 different leaf patterns: oak, birch, aspen, maple, sweet chestnut and beech. Made from sustainably sourced beech wood. Tiles measure 2 1/2".